Hair is a versatile form of self-expression. 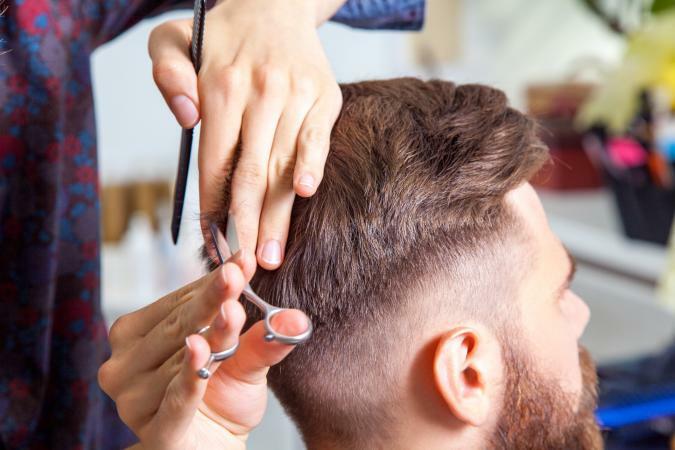 The right cut and style can suit your mood, personality, and preferences. These days, there are many popular hairstyles for men, including the undercut. This look can be worn in a variety of ways, making it an ideal choice. Styling options are endless for the undercut. It may be slicked back, part of a messy quiff, or even styled into a man bun. This gives the look more versatility than most men's hairstyles. The undercut has a short underside and longer length on the crown. Everything below the temple line is buzzed using clippers, at a setting between one and three. The contrast between the shorter sections and the length on top creates a dramatic look. Variations of the style, like the fade and the surfer-inspired undercut, both made GQ's list of the 10 coolest haircuts. With so many ways wear it, the undercut can be as unique as you are. While the undercut may be on trend, it is certainly nothing new. This particular style has a rich history. It dates back to the Edwardian era, but was also popular in the 1920s, 30s, and 40s. It had a resurgence in 2010 and continues to be worn today. Celebrities like Brad Pitt, Justin Timberlake, and Colin Farrell have all sported versions of the undercut. This has made it a staple for both the red carpet and the runway. 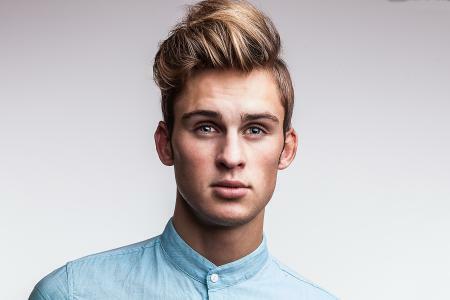 With the right haircut and styling products, it is possible to create an unforgettable undercut. For a look that never goes out of style, choose the classic undercut. This has trimmed sides with longer length on top. However, the length is not dramatically long. 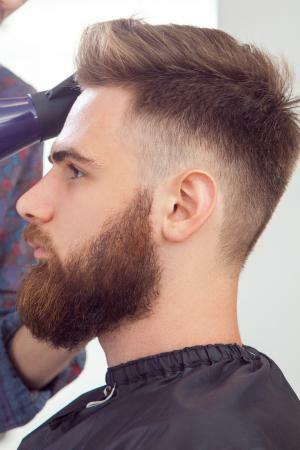 This style tends to have a fade effect (where the length blends from longer to shorter) rather than a disconnected undercut finish (where there is a distinct line between the top and bottom sections). Separating the hair you want to keep on top. Begin at the temple and work your way back. You can do this visually or use hair clips to mark it out. Use a buzzer to trim down the sides to an eighth of an inch. Create a fade effect by changing the guard on the trimmer. You will need to alternate between a longer and shorter setting. Take a look at this YouTube tutorial on how to fade cut to perfect the technique. Finish by trimming the length on top. It may be quite short or medium length, depending on your own personal preferences. Apply a wax or pomade to dry hair. (The TIGI Bed Head B for Men Matte Separation Workable Wax, available for under $10 from Amazon, works well). This step will add texture to that top section. Work the product through and brush your hair in an upward direction. Use your fingers for a more casual look or a comb for a more polished finish. Another variation of the undercut is sleek and slicked back. This style is worn with the hair dramatically pulled back - and is a great example of old and new styles coming together. Determine where the top section should begin, using your temples as a guide. Anything above the temples should be pulled into a small ponytail so it can be kept out of the way. The rest should be trimmed using a buzzer. Unlike the classic undercut, this does not require a fade effect. The disconnected look works best as it creates a more dramatic contrast between the length on top and those shorter sides. Blow-dry your hair until it is completely dry. Take a hair styling product like pomade and apply generously to the length on top, slicking it back as you go. 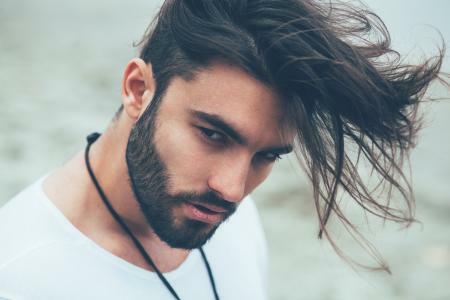 Other options include swapping pomade for a strong hold gel like L'Oreal's Homme Strong Hold Gel, available for under $15 (this is ideal if your style requires extra staying power) or a matte styling product like Paul Mitchell's Ultra-Matte Styling Clay for under $20 (which will instantly give it a trendy twist). Once the hair is coated and pulled back, use a comb to brush the hair into place. This next style is anything but ordinary. The pompadour, also known as the quiff, takes a page from the past. It features 1950s-inspired height with shorter length on the side. Separate the hair on top (from the temples up) and make sure you have plenty of length to work with. The more hair your have, the easier it will be to create that pompadour. Buzz the rest. How you trim the hair is up to you as this look suits both short and slightly longer lengths. Blow-drying the hair completely. To achieve lots of volume, use your fingers to lift the length upwards as you go. This will make styling much easier. Work a strong hold product through, like the Smooth Viking Hair Care Styling Cream (under $15), for a textured and voluminous look. Use a comb to spread the product evenly through the hair. Brush the length all the way up and then use your hand to pat it down. This will create that curled effect. You may need to repeat this step a few times to get the desired finish. Add on hairspray to give your pompadour style plenty of hold. To make the style appear laid back and messy, swap the styling cream for a medium hold pomade, or skip the blow drying altogether. Let your hair air dry before adding on product. Some hairstyles know how to make a statement. The long undercut, for example, always stands out. It has buzzed sides but is paired with very long length on top. Many celebrities have been known to wear this style, including Jared Leto and David Beckham. Leave plenty of hair on the crown. The longer, the better! Pull the hair from the temples up into a ponytail or bun. Now to focus on the rest. Use a buzzer to trim down the remaining length. For best results, it should be cut quite short. The shorter the underside is, the more juxtaposition there will be. Let down that ponytail or bun. Though length is important for this style, this section still needs to be trimmed. Give the hair more movement (and cut down the weight) by adding in long layers. Undercut Man Bun: Give your length a trendy twist by pulling the hair into an undercut man bun. Pull back with your fingers, twist or fold the length, and secure with an elastic. This style will effortlessly showcase that shaved underside. Long Slicked-Back Undercut: Take slicked-back style to a whole new level by creating a long slicked-back undercut. Coat the hair evenly with mousse and comb the length straight back. The longer it is the more intense the look will be. Spiked-Up Undercut: Give your long undercut lots of height by embracing your inner rock star. A spiked-up undercut will look truly dramatic. A word of warning - this punk inspired style requires some seriously strong hold hair products. Though men originated this look, the undercut style for women has become more popular in the last several years. That means absolutely anyone can wear this stylish and versatile hairstyle. 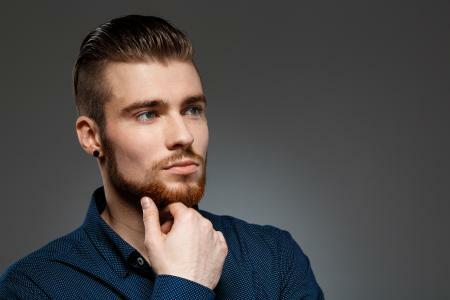 For men that choose this look, there are plenty of options in cuts and styling techniques, so you can get a hairstyle that fits your personality and lifestyle perfectly.